The I-O 2677M Modular Twinax Display Station is a low cost, modular midrange Twinax display station which is compact and fully featured. 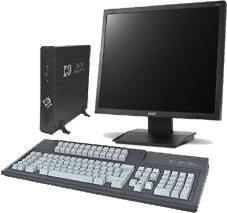 The I-O 2677M includes the Twinax Logic Module, a 122-key or 102-key keyboard, Twinax-Y Cable and a universal power supply. 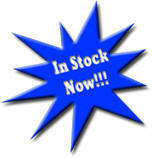 PLEASE NOTE: The I-O 2677m is only available as a refurbished product. We also have the following refurbished Twinax terminals available. They are fully compatible alternatives to the 2677m. The I-O 2677M* includes a 90-Day Warranty. The I-O 2677M is a leader in modular Twinax display stations for those who have not made the jump to Ethernet connectivity and those who need the rock solid stability of "green screen" Twinax Terminals. Reduces power consumption on the monitor. 80/80, 80/132, 132/132 modes for multi-task operation. Saves 40-50% of power, reduces power consumption to 18 watts. 5224, 5225, and 5256 emulations allow flexible, low cost printing. New Line, Form Feed, Stop, Start, and Cancel are all available from the keyboard. Allows control of all user-programmable features of the printer. Local print copy at any time. Allows keystrokes to be typed when display is inhibited. Up to 1570 keystrokes of Record/Pause/Playback past enter with security options. Reverse the background and text of the screen. Blanks the screen and inhibits input from the keyboard without signing off the display. Allows customization of printer tables which provide attachment to various printers. Diagnostic tests that indicate what is occurring on the Twinax cable.